Charcon hydrokerb is a unique drainage system for use on city and urban raods.car parks and many other applications where integal kerb and drainage is required. particularly suited to areas where depth is limited due to existing services or where space/location demands that the existing kerb line is maintained. 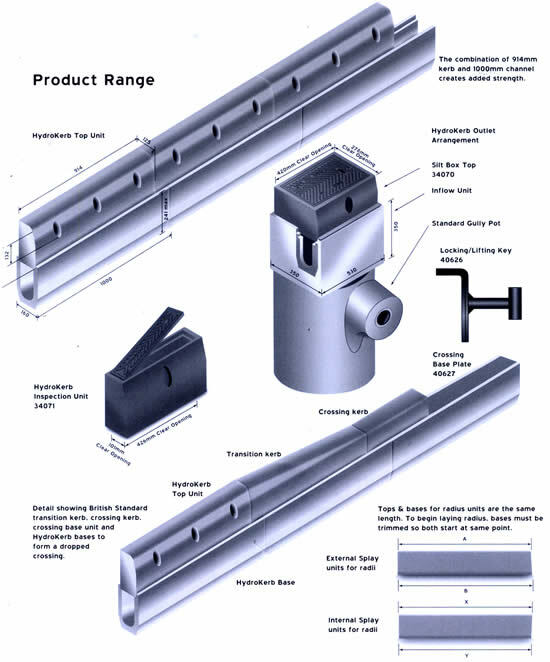 the system is comprised of a channel base unit, (available in a number of depth options) and a british standard profile kerb incorporating drainage holes. this combination gives excellent drainage charachteristics and the visual appearance of a traditional kerb with a number of aesthetic options to choose from. the unique characteristics of charcon hydrokerb make it the most cost effective drainage system available. choice - standard and textured cornish granite. eliminated with the built-in fall system. long base units and standard kerb tops. units giving ultimate design and on-site flexibility.